When you need simple and affordable coverage for any need, RBC Insurance® offers a selection of both life and living benefits coverage on simple but customizable terms to help you supplement and safeguard your income against unexpected events. With a wide variety of insurance plans offered by RBC Insurance, we invite you to learn more about the individual benefits of insurance under RBC Insurance. A simple plan for simple needs shouldn’t be a hassle for a family in need. That’s why RBC® Insurance lets you choose the simpler path: affordable term life insurance. You also have the option to choose a term length of your choice and adjust the terms of your coverage at any time. RBC Term Life Insurance 10 or 20 years Ages 18 to 70 Fixed premiums, renewable and convertible to age 80. Ideal for larger amounts of coverage. RBC YourTerm™ Life Insurance Choice of 10 to 40 years. Up to Age 85 less the term length chosen. Fixed premiums for the length of term chosen. Convertible to longer terms or permanent coverage if desired. Policy is paid up at age 100 and will remain in force. Recovering from a serious illness requires more than financial aid – it also requires access to medical services that can guide you on the path to recovery. RBC Critical Illness Insurance offers not only financial assistance when you’re ill, but resources that can help you compare and choose the care services that will help you every step of the way. RBC Simplified Critical Illness Plan 10 year term Ages 18 to 50 Up to $75,000 in coverage for cancer, heart attack, and stroke. Benefit from Best Doctors and Healing Journey support services at no cost. RBC Critical Illness Recovery Plan 10 year term, or to age 75 Ages 18 to 65 Covers over 30 common serious conditions. Includes Best Doctors and Healing Journey benefit. After age 55, you may convert your plan to a Long Term Care plan. Whether you’re self-employed, work in an office, or you're a tradesperson, disability insurance is valuable at any stage in your career. RBC Insurance offers a wide selection of affordable disability life insurance plans that will protect your income after a facing a disability and allow you to focus on your recovery. Bridge series™ Ages 18 – 60. Coverage amounts from $3,000 up to $25,000. Level premium coverage that is guaranteed renewable to age 65. Foundation Series™ Ages 18 – 60. Non-cancellable coverage up to 65. Fundamental Series™ Ages 18 – 69 for loss of income due to injury; coverage to age 75. Ages 18 – 64 for loss of income due to illness; coverage to age 70. Guaranteed renewable disability plan. Ideal for people without disability coverage from work. Professional Series™ Ages 18 – 56. Long-term coverage for people who are non-salaried or work on a fee-for-service basis. Coverage for ages 18 – 55 ranges from $8,000 - $25,000. Coverage for ages 56 – 60 ranges from $5,000 - $12,000. Business Loan Protection Ages 18 – 55. A disability plan that helps business owners pay outstanding loans when totally disabled. Maximum benefit: periodic pay -$10,000; lump sum pay - $250,000. Disability Buy Sell Ages 18 – 60. A disability plan for principals of businesses and owners of small businesses. Maximum coverage amounts: 360-day elimination period - $1.0 million; 540-day elimination period - $1.5 million; 720-day elimination period - $2.0 million. Business Overhead Expense Ages 18 – 60. This plan is tailored to principals of businesses or practices and owners of small businesses. Covers fixed monthly business overhead expenses until the owner is able to work after facing a disability. Coverage ranges from $5,000 to $40,000. 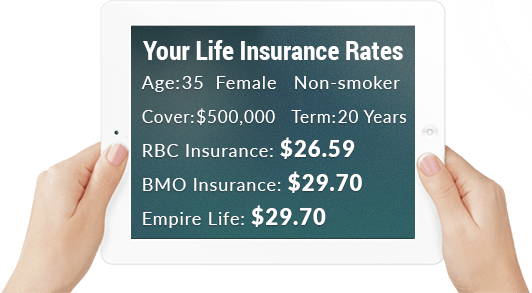 We are pleased to offer all life insurance products provided by RBC Insurance. For a quote on all available life insurance plans, please use our no-obligation quote provided on the right to explore your options and find the right fit for your needs.